I used the ‘cut and cover’ method for tunnel building. 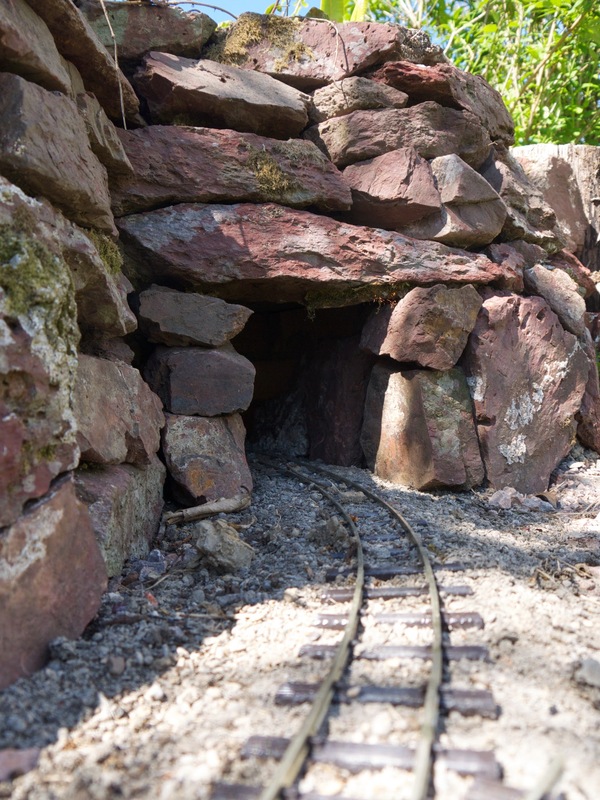 It’s advisable for tunnels on garden railways to be less than two arm-lengths long, if you want to be able to recover your derailed train. That’s fine, my tunnels are mostly to hide the tight radius curves, as well as punch through the hedgerow. Following my lazy modeller instincts, I decided the simplest form of tunnel building would be bricks topped with a paving slab. This might not be a cosmetic delight, but I could disguise it completely at either end with stone round the portals. I excavated a section of hedgerow, and prepared the trackbed. I built up the tunnel walls. After the dry-wall effort on the Eastern Ledge, I’ll admit I used mortar here. I didn’t want earth trickling through any gaps as clearing the tunnel would be challenging. Before I put the ‘lid’ on, I laid the track. 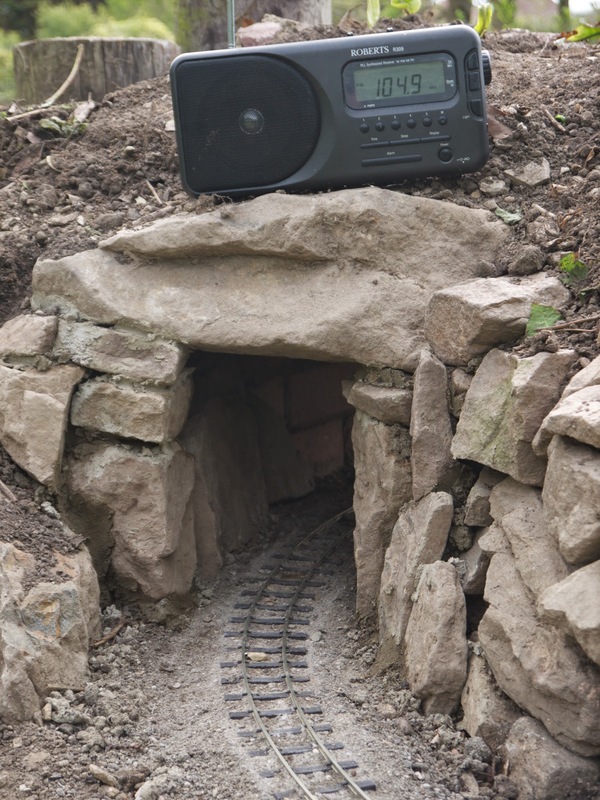 Once the ballast was dry and I was confident that trackwork was of a reasonable standard, I placed the paving slab on top, built up the stone surrounds, and then filled the earth back in. 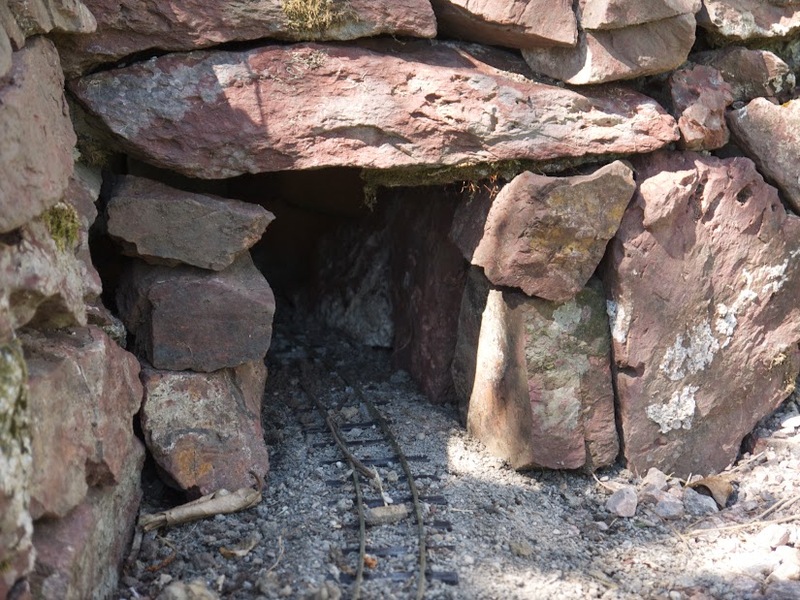 Finally, I carefully chose some stones to narrow the tunnel entrances. Because these are cosmetic additions, if I later acquire something to wide to run through, it’s a relatively simple job to knock these out and replace with narrower stone. Photos taken 3 – 23 May.